Home / "An Awkward Day"
Maundy Thursday is a day associated with two important events. The Last Supper and the Washing of the Feet. How do we choose which to emphasize? I struggled with this, until I happened across a remarkable painting by one of my favorite artists, Stanley Spencer. It is called “The Last Supper” and was painted in 1920. It’s found in your bulletin. Like most of Spencer’s paintings, there’s latent humor in his art. What this painting captures is the immense awkwardness of that Thursday evening—and this is precisely why I like it so much. I consider Maundy Thursday to be perhaps the most awkward day of the year. When we look at the painting, front and center we are confronted by two rows of bony feet with lots of sets of toes. These toes stick out from garments and are painted in such a style as though they have been sculpted. The feet are decidedly clean (presumably they’ve already been washed) and they almost shine with the bright light that falls upon them. Yet, look closely, these toes are far from perfect, and you can see that some of them are bent. Perhaps it’s the onset of rheumatism. These are hard-working feet. Stuck out there, they are almost touching their neighbors—these are big men in a tiny room barely large enough to contain the disciples and their feast. To compound the awkwardness, when you try to connect the feet and garments with the disciples sitting behind the table, you get confused. Even though to the right there are four disciples and four pairs of feet sticking out from underneath the table, they really don’t match. The disciple at the end of the table on the right has to be sitting in a very strange, uncomfortable angle in order to fit with the pair of feet at the end of the row. Now, look at how the disciples are sitting. It seems to take the disciples at the right some degree of effort to keep themselves sitting upright. One little push, and they’re going to slip right down to the floor. These disciples grip the edge of the table, almost as if to hold themselves up. I look at them, and my lower back begins to ache in sympathy. It’s uncomfortable, and awkward, there’s just no getting around it. Now look at the disciples on the left. They are sitting down more comfortably, although, if you look at the first three disciples, they are holding their hands in a strange gesture—almost as if they are repelling something. And, if we look at their backs, we see something protruding. Are those pillows, or could they be wings. It’s rather difficult to tell. Turn your attention now to our Savior at the head of the table. His head is rather small—but his hands, well…now, they’re huge. He’s looking intently (or skeptically—it’s rather difficult to tell) at the disciple…John…who is bending over with wavy hair to inspect the bread. Wine is nowhere to be seen. At Christ’s own left hand a curious figure is furtively putting something into his mouth. He appears rather sneaky—and, since he’s the only one eating—as the bread is being broken, I liken him to the person who grabs a hasty mouthful before the blessing is said. Most likely, this is Judas. Now, ask yourself, what is that strange, large hand doing there between Judas and Christ? Has Spencer made a mistake? Because, if you look closely, you realize this hand cannot belong to Judas. Nor does it belong to Jesus. Unless someone is hiding under the table, my best guess is this is the hand of God. What’s more, nobody looks cheerful at this feast. The disciple in the foreground to the right appears bewildered at the opened bread, the men to the left seem to make an averting gesture. The disciple at the back to the right holds his hand pensively to his mouth as if pondering what on earth is going on. As we look at the background, we see meticulously rendered rows of bricks with light and shadow effects that are particularly striking. Personally, I think the room resembles a prison cell. There is a window—and those lines on the panes could just as easily represent bars-except we see here that this is a window and it is open. If we look at the light, we see that it is playing a mysterious role across the table in the bowls and pieces of bread, which almost seem to glow, don’t they. Where is it coming from? The window to the right seems too small to be letting in so much light in a tiny, cramped, cell-like room. While it is clear that this painting is of the Last Supper, discerning all of its meaning is difficult. Perhaps our best bet is to go with the feelings this art evokes in us, the watchers. If we approach the painting from this vantage point perhaps we too can feel the great uncertainty of this time for Jesus and the disciples. The joy and celebration from Palm Sunday must, by now, feel long gone. Instead, here they are, in a cramped room. Joy is absent, as is camaraderie. The disciples had no way of knowing just how important the next three days would be for them; yet by now, they probably had a sense of foreboding. Perhaps, even now, they could sense an air of trouble thickening around them as the golden light of late afternoon begins to slip into night with shadows beginning to play upon the walls. I believe this painting has the capacity to speak to us. When I feel trapped in my personal prison I am reminded that there is hope (symbolized by that window—small, yet open). There is light in that room, despite the awkwardness that pervades. 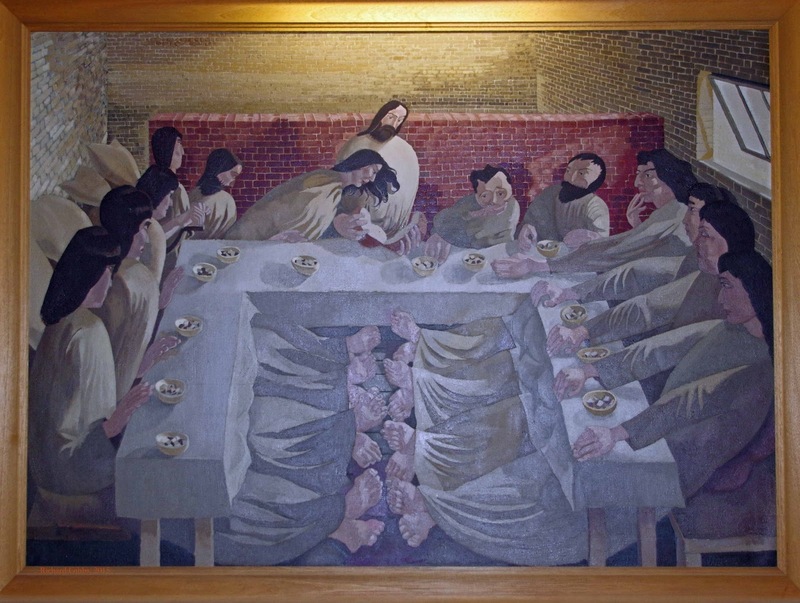 The Last Supper, as painted by Stanley Spencer reminds me that perhaps, in journeying to Easter, we have to go through our own time of uncertainty. More than this, this painting also elicits a sense of wonder and imagination. Spencer’s images remind one of dreams, surrealism, deep symbolism and alienation. While looking, a strange sensation takes over. You wonder most of all what causes the suspense in the image and the feeling of heaviness and foreboding in your stomach. The tension is rising. What is about to happen? Maundy Thursday invites us to participate in the drama and find out for ourselves. In Jesus’ name. Amen.